Naturally detoxify, lose weight, improve circulation and increase your metabolism in 15 minutes! Additional benefits of FIR sauna are: improved circulation, breaks up clustered blood proteins, reduces lymph nodules, improved wound healing, speeds injury recovery, improves WBC function and increased immune response, decreases muscle and joint pain, decreases muscle spasm, releases N.O. (nitrous oxide), increases N.O. 2 production, decreases edema, promotes the health of the skin's collagen, increases the oxygen supply to the tissues and alkalizes body pH! The Scientific Basis and Therapeutic Benefits of Far Infrared Ray Therapy by Dr.Kyuo (edited by Justus F. Lehmann, M.D., Williams, and Wilkin), states that Infrared heat therapy does the following: - Affects soft tissue injury - Increases the extensibility of collagen tissue - Assists in resolution of inflammation, edema, and rids the body of metabolic waste - Decreases joint stiffness - Relieves muscle spasms -Increases blood flow and - Leads to pain relief. What makes the Relax sauna different from other far infrared saunas? Only the Relax Far Infrared Sauna has this patented ceramic far infrared generator technology. The ceramic chip used by the Relax Sauna is a patented ceramic chip that only the Relax far infrared sauna has. This chip is "tuned" to emit a certain frequecy of far infrared in the 4.4 to 14.4 micron range. This is the perfect range of infrared for the body to absorb. Because of these chips(the Relax sauna contains 48 of them) the sauna emits both the highest and cleanest levels of infrared compared to any other sauna. You can see the 2 radiators in the Relax sauna. Each radiator has 24 ceramic chips. What far infrared generators do other saunas use? Other far infrared saunas use "hot plates", electrical wires and carbon panels to emit infrared. The problem with these are 3 fold. 1. They surround your body in EMF radiation. 2. They do not emit high levels of far infrared. 3. The frequenct of infrared is not as pure as with the ceramic chips of the Relax Sauna. 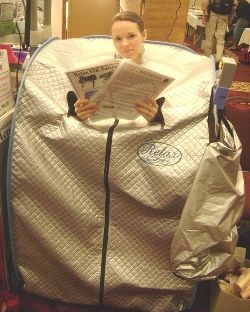 Other portable "FIR" sauna generates only about 30% far infrared Light. They use a far infrared cloth which covers a metallic grid, or hotplate. It appears that there is no legal definition regulating what can be called a FIR Sauna. When you see a sauna advertised as FIR, It means to me that it is at least 25% FIR Energy being generated. Each company "Should" be able to tell you what percentage of the generated light in their sauna is FIR light (healing light). NOTE: The remaining percentage of generated light CANNOT be absorbed by your body. Unfortunately, most individuals selling these saunas have NO CLUE that their saunas are NOT even close to 100% FIR. On the other hand, our technology is the same as that in our Sky Eye Radiator. The Sky Eye Radiator has been issued a 510(k) number by the FDA, designating it as a medical device. "The Relax Far Infrared Sauna that I purchased is awesome. I have been looking for the best sauna for awhile now. It is the "real deal" and as far as I know this unit is the only one with medical device technology in the states. I especially love the flexibility of the sauna. The most important feature is that this particular sauna has a patented semi-conductor chip (which is the differentiating factor) which allows the absorbable FIR energy - the good 4-14 microns at temps up to 140-170 degrees - good for the body and with no harmful near and medium infrared rays. Other far infrared devices do not have this semi-conductor chip and hence do not generate far infrared light at high temps. The amazing thing is that even though one sits in high temperatures, it is extremely comfortable. It is uniquely compatible with our energy and easily absorbed by the human body. You can actually feel its healing properties while sitting in the sauna." For added detox, try Dr. Kelley's mud/clay therapy with sauna treatments or castor oil packs for scar therapy!